What happens when wanderlust becomes more than just a passing feeling? What if it was possible to make vacation mode, your everyday mode? The Manuel family has been living nomadically for over two years, doing exactly that. They traded in a traditional career and home for a life filled with experiences. Today we’re excited to welcome Dai and Christie Manuel all the way from Bali, Indonesia to discuss how they shifted their perspective and their lifestyle. We discuss common reasons and fears why some families want to, but never take the nomadic leap. Meet Dai and Christie Manuel, who have been living nomadically with their two daughters for over two years. 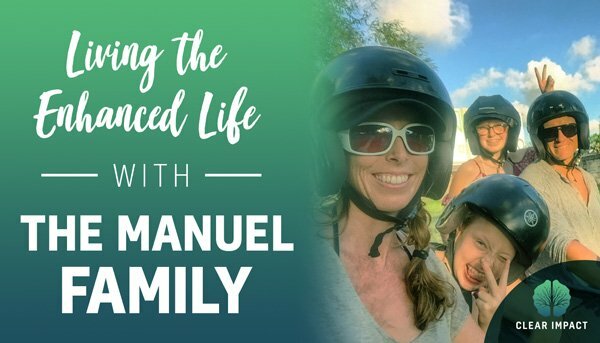 Find out what inspired the Manuel’s to leave established careers and travel the world as a family. Learn how to get uncomfortable and why this is a good thing. Discover common barriers to taking action in your life and how they can be overcome. Connect with the expansive and welcoming family adventure community. Find out what Dai and Christie consider to be the best age to take your kids travelling. Begin to shift your mindset and learn how to thrive on life experiences.